Certificate of Entitlement (COE) prices ended mostly higher all categories in the last round (Dec 19) of bidding exercise for the year. The biggest surge was seen in premium for Category A (cars up to 1600cc and 130bhp) which ended at $25,501, 8% higher from last round $23,568. Premium for Category B (cars above 1600cc or 130bhp) remained at $31,001. Premium for Category C (Commercial Vehicles) fell to $27,001 from $27,009 and premium for Category E (Open) went up to $31,809 from $30,851. 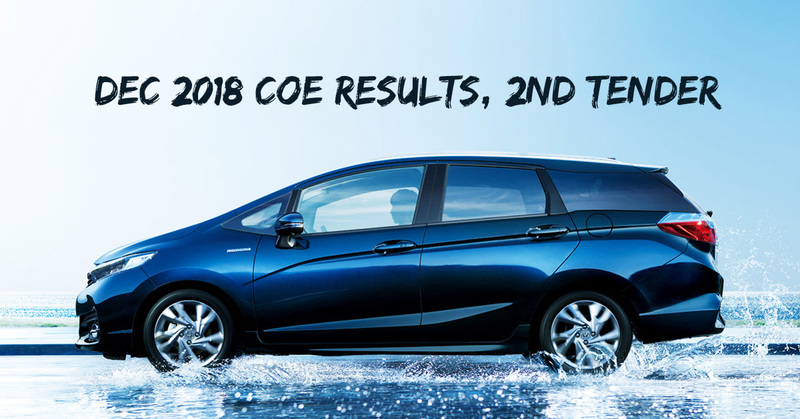 COE for year 2018 started off with a downward trend since November last year. In particular, Category A premium dropped the most significantly. In July, the COE prices for Category A dropped more than $9000 to below $25,000 for the first time this year. Earlier this month in the first round of December bidding, prices dropped even further to $23,568, the lowest in 8 years. This is despite the zero growth policy in car population that took effect in February. We first expected COE prices to increase with the implementation of the zero growth policy. However, the policy have contributed to uncertainty in the market along with changes in vehicle emission tax, hence the fall in COE prices instead. The fewer car models available in the market is also another reason for consumers holding back on purchasing a new car. Nevertheless, turn around in the demand for new cars is expected to happen soon. Thus, now is a good time to shop for a new car while COE premium is still low. Do drop by our showroom at 50 Ubi Avenue 3 to view the cars available. Alternatively, call us at 6585 5555 to find out more from our sales executive.